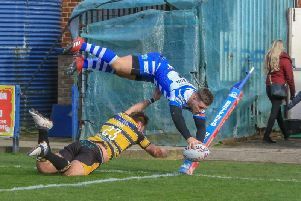 Halifax coach Richard Marshall believes Whitehaven’s players will attempt to turn the 11th-hour exit of coach Steve Deakin as a “positive” ahead of Sunday’s Championship opener. Haven were stunned when Deakin left the club last weekend with star Australian half back Brett Seymour, who has had a chequered and at times troubled career with Cronulla, New Zealand Warriors, Hull FC and Castleford, swiftly placed in temporary charge. But while the Cumbrians appear to be in disarray - with Deakin having overseen pre-season hidings by neighbours Barrow and Workington by an aggregate score of 68-4 - Marshall predicts Seymour’s troops - bolstered by the late loan signings of Widnes pair Paul Johnson and Grant Gore - will try and turn it to their advantage. “Changes in coaching staff can bring the best out of groups of players, there are plenty of precedents for that,” said Marshall. “There will be some uncertainty, but it’s going to backs to the wall time for them. “Honestly, I don’t see it as being a negative for them; it’s the first game of the season, everyone is fresh and motivated to get out there and play. “It’s been a long pre season for both sets of players and everyone wants to get out there and play in a game where league points are at stake. Marshall, who will be taking charge of his first competitive game since taking over from Karl Harrison in the autumn, is expecting a typically physical contest on a pitch renowned for its narrow, heavy nature. “It’s going to be the same for both teams and it’s going to play a part in the game and the way we approach it,” said Marshall. “We need a good kicking game, good discipline and relish being in the arm wrestle. “I’m not expecting us to be perfect, but I do want us to try and combine the things we’ve done well at times in the pre season games against Hull KR and Huddersfield. “I want that attacking shape, footballing ability and confidence to play that we had at Hull KR, with the defensive intensity we had in the second half against Huddersfield, when we controlled them pretty well.